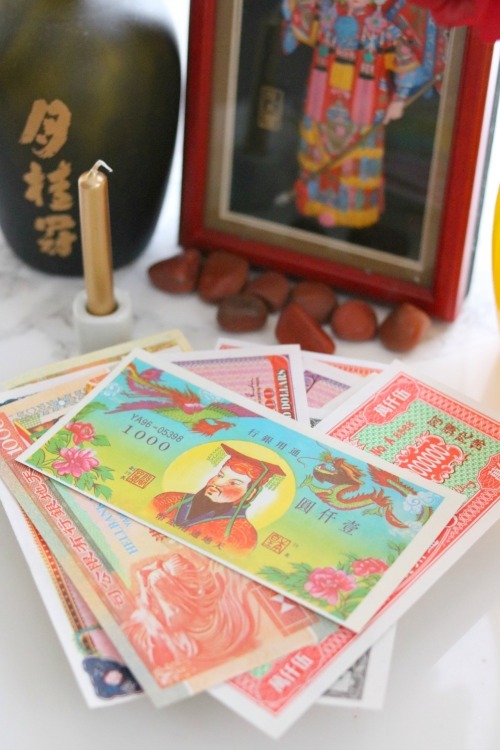 Ancestral veneration is vital in Chinese culture and there are a number of funerary rituals passed from generation to generation to appease the souls of those loved ones departed. One of those customs includes the burning of “Hell Notes”. The Chinese do not view the word Hell as it is most commonly defined. The term “Hell” is described as the realm of the dead and not necessarily where souls are punished or condemned. It is believed in Chinese culture that this place of “hell” is where souls are renewed for reincarnation. The customary Chinese belief is that the realm of the dead is a place where souls experience the afterlife. 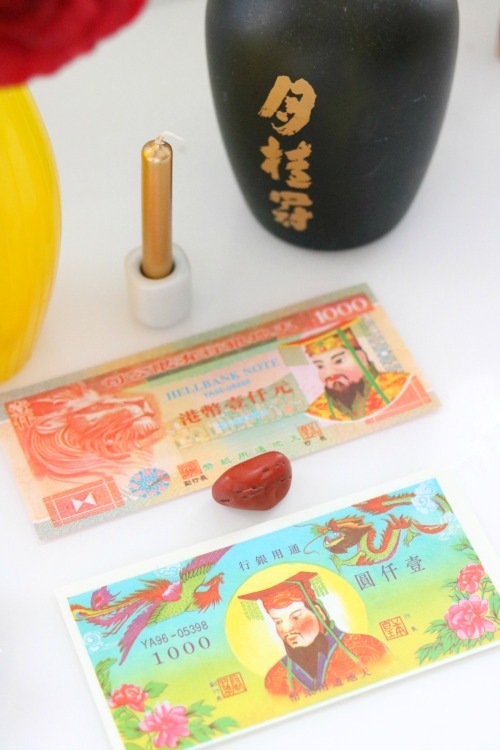 In the afterlife, souls are offered incense, food, among other offerings including Hell Bank Notes. These notes are burned for the ancestors to provide abundance and prosperity for both counterparts in the astral and physical realms. “Hell Bank Notes” come in interesting denominations from $10,000 to up to $500,000.000 & more! Talk about inflation! The symbolism in these bank notes is the reassurance that money is not an obstacle and is abundant in all dimensions. So, in short that is the background of the name of my blog. I burn hell notes regularly for my ancestors be it my African, Hindu or Chinese ancestors. Yes, I have ancestors from every continent on this planet and NO, I don’t need ancestry.com to prove it to me. 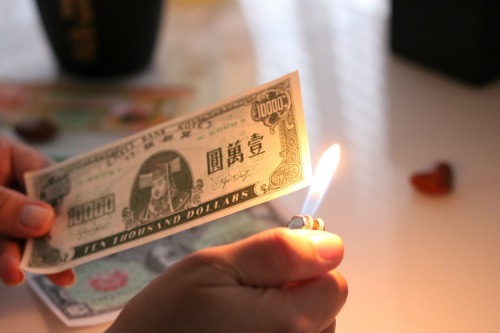 Money is nothing less of a form of energy. How you interact and think about money determines how you attract and manifest abundance into your life. 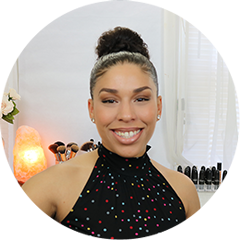 Here’s a quick ritual I will share with you to manifest wealth and abundance into your life. Find a table in a clear, quiet space free of clutter and distractions. Hell Bank Notes (you can purchase at the shop here) or a Blank Check from your check book or you can go online and google, “blank check template” and print one. 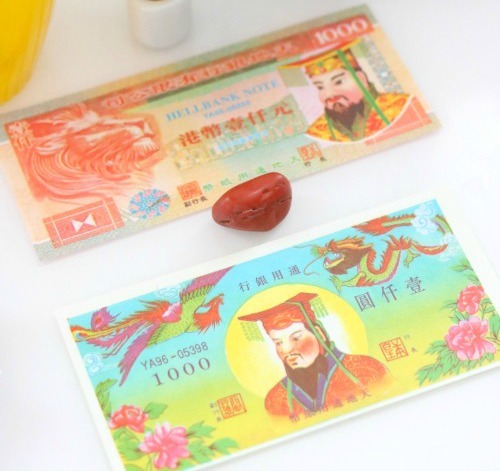 If you have the bank notes, your bank note will already have the denomination as mentioned can be from $10,000 to whatever your money dreams desires. If you have a blank check or template, then you can simply write yourself out the check in any amount you want or specifically need. On the 7 pieces of paper write out the reasons for abundance. Such as to ensure you’re able to secure that raise at work, ability to gain opportunities for work, assist with job hunting, etc. Whatever reasons you may have they’re all valid. Everyone must find a way to make a living and provide for their families. Your requests should not be about greed or excessive self-indulgences. Once you have completed writing down your petitions & requests, you can start burning each hell note you have in hand (or check) followed by your notes. Make sure you burn over your abalone shell or plate to ensure the paper does not burn on your hand or floor. As you notice it brun all the way, simply place the paper on the shell/plate and let it burn out completely. You can either light a candle or quietly meditate for several minutes focusing on the intent you manifested. Such an interesting read! Thanks for sharing with us.